Yes, it's time to hit the road again for my annual multi-month adventure. This time I will be away just less than three months. I don't normally take a big trip in the summer but I have a good excuse...well I think it's good! July is the only month I have never been in England AND I have always wanted to spend my birthday in London. (mid-July) Well those two things sounded good enough for me to extend my visit anyway...but then I can justify anything I put my mind to! So what am I getting up to on this journey? Lots!!! I am doing something different this time - I have a travel companion! My cousin Joanne will be accompanying me for the first three weeks! When we arrive into London Gatwick we will immediately head north to the city of York for two nights. Plans include visiting beautiful Yorkminster, walking the ancient city walls and hopefully having a cream tea at Betty's tea room. York is my second favourite city in the UK and I never grow tired of it. Then we will head east but still in Yorkshire to visit our cousins and see a bit of the countryside as well. Then it's up to Edinburgh for four nights where we plan to see all the sights such as Edinburgh Castle, the Royal Mile and the Queen's former ship, the Britannica as well as take a tour to see Stirling Castle and Loch Lomond. 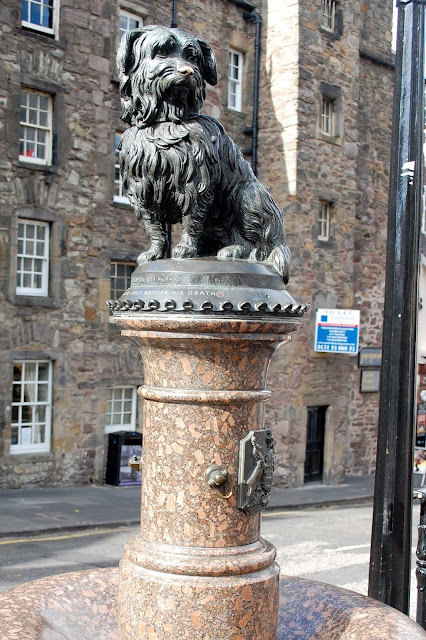 I can't wait to say "hi" to this fellow again - Greyfriar's Bobby! I have booked us into a two bedroom Airbnb flat in the Stockbridge area and one of my goals is to see pretty Dean Village which is nearby. Then on to the Lake District...as you know I love it there and it will be almost a year to the day that I will return. We will be taking the Ten Lakes Spectacular tour, visiting Hilltop and walking in William Wordsworth's footsteps. Weather permitting we will also be walking to see Tarn Hows which was my Aunts favourite place in the Lake District. I was a bit leery about walking there on my own last year as was unsure of the route but it's easier when two people are lost together! Not only that, but we are going to go to the pub where my Aunt and Uncle had their honeymoon for a meal! We still are trying to figure out how we will get there as we won't be driving and there is no public transport to the Inn but that's why they invented taxis! We will be staying at the same Bed and Breakfast I stayed in last year. 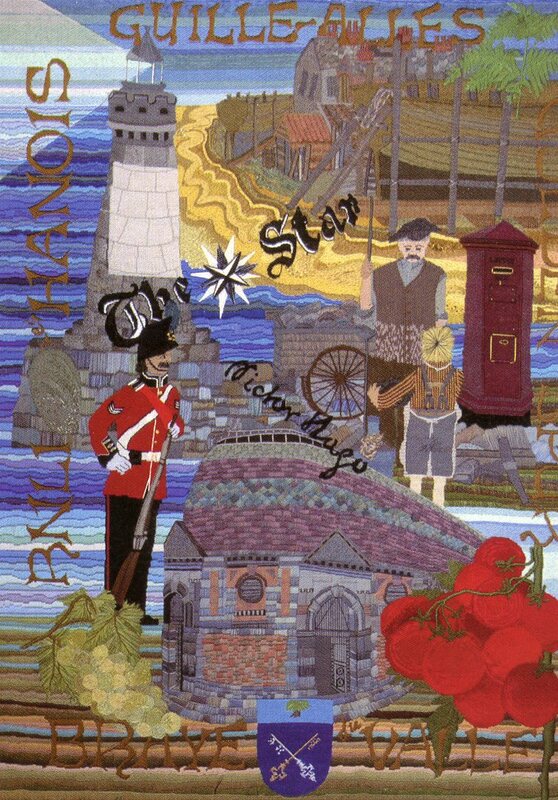 On to Llandudno which is on the coast of North Wales where I have booked us into a two bedroom flat on top of a tattoo parlour - oops, don't think I told Joanne that part! I have been in that area previously in 1984 and memories are hazy. I pulled out my photo album and it was like looking at someone else's pictures. Scary...but there has been a lot of "water under the bridge" since then. The only thing I remember clearly is my friend and I getting our hair dyed red, white and blue at a fun fair. Don't think I'll be doing that this time! Plans include visiting a few of North Wales famous castles and doing a train trip up Mount Snowdon. Then it's down to London where for six days I will show Joanne all my favourite places - this will certainly keep us busy and out of mischief - well maybe not quite out of total mischief! We have tickets to a couple of musicals and hope to take a walking tour or two as well. After Joanne flies home I will stay on in London for a week and hopefully get back on the Thames Path as well as the Capital Ring. With a Bank Holiday weekend in there I will be avoiding central London. At the end of May I fly over to Copenhagen where I will have three days in an Airbnb and time to explore before heading to the south coast where I will be visiting with my friend Berit and her husband Alfred for five days. My friend Claudia from Germany (yes there is London Claudia and German Claudia - it confuses my friends no end when I start yakking about Claudia) will join us. It's the first time all three of us have been in the same place at once. Plans were made in 2004 but were thwarted when I had to have my gall bladder removed. Then I go solo and head off to three new countries. I will take the train to Stockholm - I splurged (a bit) and got myself a first class ticket which was still much cheaper than flying. I will stay for a week in an Airbnb in the south part of the city. I can't wait to explore Stockholm! The Vasa museum, ABBA museum and going on ferries to explore outlying islands are a few things on my very long itinerary as well as seeing Phil Collins (at last!) in concert. I also hope to visit the nearby city of Uppsala. I then fly to Helsinki where I have five nights in an Airbnb. The flat I am renting a room in has a balcony with a view of the ocean so am looking forward to relaxing with a good book as by then I am sure I will need a rest day! The flat has a sauna which will be fun and there are enough museums in the city to keep me happy. I hope to take a day trip or two into the Finnish countryside. The last new country I will be visiting is Estonia. I will take a ferry from Helsinki and am staying in an Airbnb in Tallinn that is very close to a popular local park. I will be there four nights and plan to visit the KGB museum and explore what looks to be a very quaint town centre. I think I have planned the perfect time frame (for me) in each place. By the time I get to Helsinki I will have been traveling for almost two months and will be slowing down. It was tempting to carry on to Riga, Latvia but I decided that enough was enough. I prefer quality over quantity. I like to get to know a place rather than dash in for a day to "tick" it off a list. I look forward to leisurely days wandering and photographing with time to sit in coffee shops and work on my journal and perhaps do some blogging. Staying in Airbnbs makes it so much more affordable as not only is the accommodation much cheaper than hotels but I can cook or bring food back. I have opted to rent rooms in homes rather than have a flat to myself for the main reason that it's cheaper and you get to meet a local family. Scandinavia is expensive and while I might "splurge" on one nice restaurant meal (trying a local specialty) in each place I will likely be eating a lot of open face sandwiches from sandwich shops and local snacks from grocery stores. Of course, I will have my usual "rest days". After the first three busy weeks, I am planning a couple of leisurely days in London getting laundry done, having my hair cut, yakking with Claudia and binge-watching BBC and ITV iplayers. The new season of "Line of Duty" awaits as well as "Luther" to name a few! I will then fly to Toronto (via Halifax...as tempting as it was to stop there for a couple of days I resisted..) and stay with my sister in nearby Hamilton for five nights. There will be time for a catchup with her and trips into Toronto to see my niece. I swore I would never visit southern Ontario again in the summer as the humidity is unbearable but never say never...and I will probably have had "practice" in London anyway! It just seemed logical to stop on my way home. By the time I get home on July 24th I will have been gone five days short of three months. Posts will be scarce for the first little while but I will be posting daily on my Facebook page. I hope you will tune in! It's going to be grrrrreat!!! 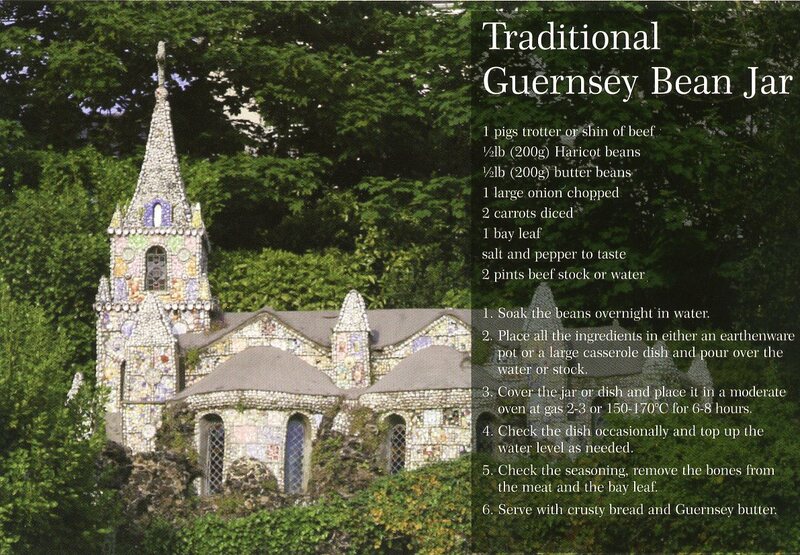 Gallivanting around Guernsey - The final part! It's been over a year since my week in Guernsey so let's put this post sequence to bed once and for all. After visiting Castle Cornet the day before I headed over to the Occupation Museum on the bus. I found the museum so very interesting and I learned so much more about the German occupation of Guernsey during World War II. Here are a few of the highlights. I was going to leave it but my spelling OCD is kicking in too badly - they spelled "Canadian" wrong. I hate incorrect spelling! Just so we're clear on this...cigarettes in the UK are called fags....please excuse the quality of these photos. All the letters and posters were behind glass. There was a method to my madness; I wanted to try the Guernsey Bean Pot soup at the Coba tea room and I wasn't disappointed. It may look a bit disgusting but it certainly didn't taste that way. Here's the recipe if you want to make it!! Then I hopped yet another bus over to Rousse Tower where I decided to do a walk to Pembroke Bay. The day before I had picked up a brochure called "Tasty Walks" and this one looked particularly interesting. There were some great views of the Rousse Tower at the beginning of this walk. Vale Parish Church - at this point the path was beside the sea but I had to cross the road to snoop in this churchyard. There are many towers along the coast which were built during the Napoleonic era as the Channel Islands were at risk of being invaded by the French. These were reinforced by the Germans during the Occupation. Then the path turned inland and alongside a golf course which ALWAYS makes me nervous...but before I knew it I was at Pembroke Bay. The walk was about 75 minutes and I enjoyed it immensely. I had just missed my bus so walked around the area a bit. My bladder made me go hunting and I found a cafe so had to sit down and have a cuppa. (that's how my days go...drink tea, pee, drink tea, pee....etc. etc. etc.) Needless to say, I missed another bus! Ah well, no worries; I was on holiday. The view around it wasn't bad either. As you can see a lot of it was created from broken mugs! I was the only visitor on this dank wet day. There is a gift shop near the property. My purchase? A little tub of yummy Strawberry Guernsey ice cream. I realized I hadn't had any yet and time was a-wastin'. The next morning dawned with more showers but I didn't let that stop me. After a last hearty breakfast I brought my luggage down so my room could be cleaned - yes it was time to head off for the next adventure. Almost, that is. I jumped on the bus to the Folk Museum in Saumarez Park. It was an enjoyable time there - I love history and seeing how ordinary people lived back through the ages. My photos sucked though so nope, not sharing them. I think the park would be pretty on a nice day! 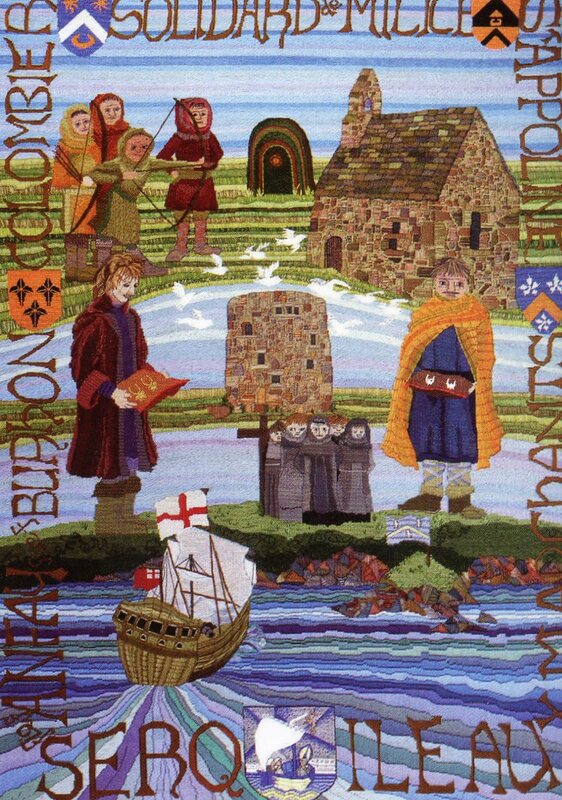 I then headed back into St Peter Port where I visited the Tapestry Museum which depicts the history of Guernsey through the ages. No photos allowed but I did buy a set of postcards. 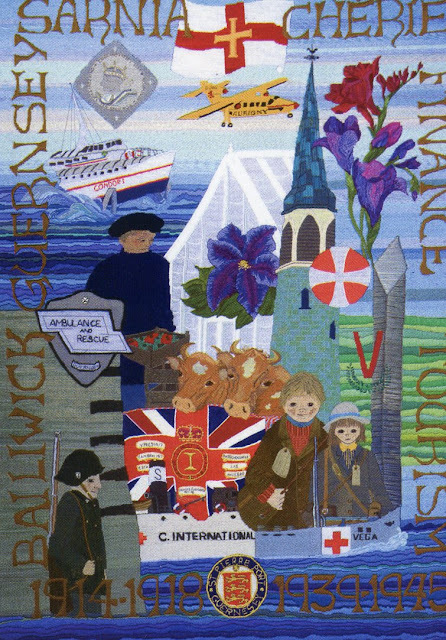 The ten tapestries each represent a century in Guernsey's one thousand year history and were created by each of Guernsey's ten parishes. Such amazing detail and so beautiful - the postcards do not do them justice. Then it was time to head back to the guest house to pick up my luggage. David, one of the hosts kindly offered to drive me to the ferry terminal with his Jack Russell doggie riding shotgun. My week on Guernsey was fun and I'd definitely recommend a visit there as it's got something for everyone - unless you like a wild nightlife. Then...nope! Will I revisit? You just never know!